You are here: Home / Teaching / Bikram, your notice has been served. Bikram, your notice has been served. In the morning of 25 Feb, I had just finished teaching two Bikram Yoga classes and was catching up on social media. After reading the latest charges being brought against Bikram, bravely posted by Janelle Leat on fb (and allowed by Jill Lawler), I was filled with disgust. Feeling so strongly, as a silent protest, I refused to practice that afternoon. But sometimes silent protests are not enough. Bikram’s influence has people running scared, especially if you’re a Bikram teacher; I once had a senior teacher threaten to report me to Bikram HQ if I taught at a non-affiliated studio. Tell me, who was more scared? Your job, reputation and status is on the line, if you subscribe to that false sense of insecurity of course. Now, I’m confident enough to formulate my own opinions, ethics and future in the Yoga industry. 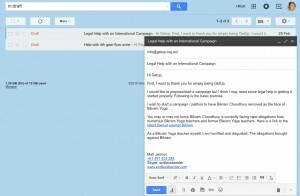 That afternoon, I removed Bikram’s name from many places on my blog. 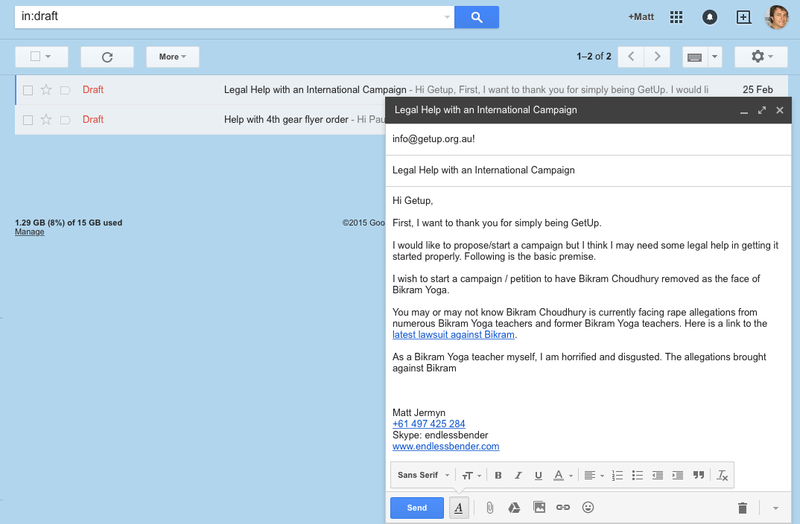 Still deflated, I drafted an email to GetUp.org to enquire about the legalities of starting a petition to have Bikram Choudhury removed as the face of Bikram Yoga. You can see my email is unfinished as I was giving myself time for reflection and clarity before going ahead; I was angry but very aware of the potential backlash. I’m a full-time Bikram Yoga teacher and even though I’m currently studying Yoga Therapy, I won’t be qualified until 2017. So at present, the ability to continue teaching in the Bikram Yoga community is important to me; plus I really enjoy my vocation. Well, it seems I’m not alone. 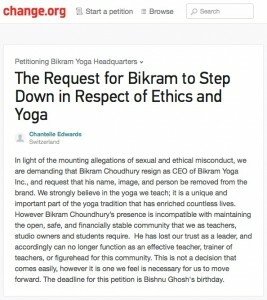 While taking a break from study this morning, I was rocked off my chair when I read a fb post shared by Benjamin Lorr about a Change.org campaign started by Chantelle Edwards, The Request for Bikram to Step Down in Respect of Ethics and Yoga. Thank you for being brave Chantelle. I’m excited others also feel this is the right and only way forward. I literally ran upstairs to write this blog post. Hold onto your mat, the ensuring debate is likely to get ugly. Before you jump up and down, start clapping or screaming, please remain calm, take your time and reflect with clarity on the future of Bikram Yoga without Bikram as the front man. I agree, and wish to comment further later. Oops I thought I’d already replied. Thanks for commenting Jeannie. Yes, I’ve checked TheHotTT.com before when people were asking me about teacher training options. It looks promising. Just so you know the link, “500 Hour Yoga Alliance, Hot Yoga Teaching Certification” returns an error 404 not found. Is it up and running and has a HotTT course graduated yet?